Traditionally, any community you come across wants their children to marry from their own faith and culture. But with people spreading across the globe, it’s becoming more normal now to marry outside your faith. People are no longer partial to the religion and background of their partner, but are more focused on compatibility. If you connect deeply with a native from a tribe in the Amazon rain forest, the way they dress, hunt or worship is the last thing on your mind. You’ll be more interested in building a lasting relationship. In America, the number of Jews marrying non-Jews is increasingly rapidly. A survey by the Pew Research Center’s Religion & Public Life Project in 2013, found intermarriage rate to be 58% among all American Jews and 71% among non-Orthodox American Jews. With the number of interfaith marriages rising, it would seem that they would be more easily accepted by rabbis. While some do officiate at interfaith weddings, others flatly refuse. It can be disappointing for people to not be married in the rituals of the faith they grew up in. According to halakhah [Jewish law], a marriage is invalid if one partner is not Jewish. Based on this rationale, many orthodox rabbis do not perform at interfaith weddings. But if you don’t find a rabbi, your options do not end. First of all, not all rabbis are opposed. There are some Reform, Reconstructionist, Renewal, and unaffiliated rabbis whom are willing to be a part of weddings where one partner is non-Jewish. Some may require commitment from the couple that they will raise their future children Jewish. For couples who wish to celebrate a wedding of two faiths, there are rabbis willing to co-officiate with a religious leader of the non-Jewish partner’s faith. 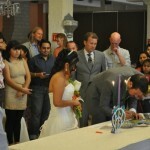 A popular option is to ask a friend to petition to be deputized for the day to perform the wedding ceremony. Having a rabbi present is not legally required, and a friend makes the day more personal. Couples looking for a low-key ceremony could go for a civil marriage ceremony officiated by a judge.